The Tokyo National Research Institute for Cultural Properties (TNRICP) has received charitable contributions from the Tokyo Art Dealers’Association (Director: Jun NAKAMURA) to support research publication (the publishing enterprise) and from the Tokyo Art Club Co., Ltd. (President: Tadahiko MITANI) to support research projects. The transfers into TNRICP’s bank account were made on November 30th, 2016. 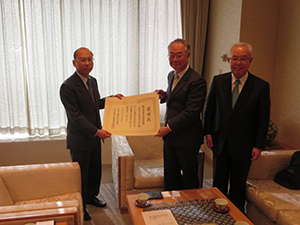 As a token of gratitude for the donations, Nobuo KAMEI, Director General of TNRICP presented a certificate of appreciation to both Masakatsu ASAKI, Chairman, and Tadahiko MITANI, President, of the Tokyo Art Club. 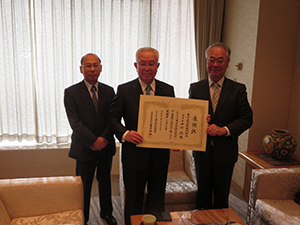 As Jun NAKAMURA, Director of the Tokyo Art Dealers’ Association was unable to attend, Mr. ASAKI accepted a certificate of appreciation on his behalf. We are very thankful for the donations and for the understanding of the work we do at the research institute. We aim to make good use of the funds in upcoming endeavors.